Ice cream parlors have become very popular and are a profitable business to venture into. However, ice cream shop supplies are expensive and sales greatly dependent on location, therefore here are some tips to help you start a successful ice cream business. 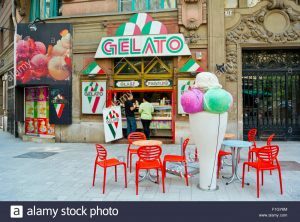 Self-owned shop or an ice cream franchise – Opening your own shop or buying an ice cream franchise involve many pros and cons. Your own shop will need less investment, as you will only need to rent out space and purchase ice cream shop supplies. But you will have to create your own business plan, theme, and layout. A franchise, on the other hand, will be more expensive but will include a detailed business plan with descriptions about store layouts, suppliers, staff training, store design, ice cream menu etc. Good market Research – You should do some research within the area(s) you intend to open your store. Look at your competition, what they offer and include these details in your business plan. Legal formalities – The legal formalities will differ from state to state. You will, however, need to approach the health department to get approval to get a business permit and or a mobile permit. A detailed plan will come in useful, as it will ensure you get quick approvals. List of products – Once you have your business permit, you can then list the products to be sold by your shop. This could include ice creams, drinks, and food, plus other items like refrigerators, tables, chairs, storage and serving items like frozen yogurt spoons and ice cream bowls.